How to Book Lahore to Atlanta Flights? Atlanta, New York, Los Angeles, Chicago and Houston are some of the outstanding visitor attractions for international travelers. Do you want to travel to all American cities in affordable rates of Air Tickets? Congratulations! You have landed at right place. We offer you Air Tickets of over 5000+ international destinations in extremely reasonable prices. Our services are rapid and full of customer care. We also provide Lahore to Atlanta Flight Tickets at your doorstep. Our company only offers this service. You can download our mobile app and do reservation by yourself. Enter dates of travelling in Flight Search Engine bar which you will see above of this page. Book any ticket and then pay online ticket fare. We also provide cheap airline tickets in the case of emergency. Atlanta is one of the most important cities of America. It situated in the state of Georgia. Most of the international visitors are not aware of it as they know New York, Los Angeles and Washington DC etc. 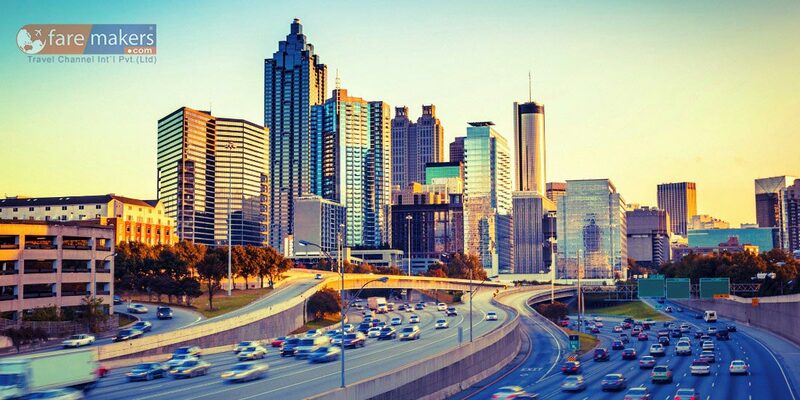 Atlanta is located in the north eastern side of United States of America and is also oldest city of America which gained political importance very early in 1837. Etihad Airways, Turkish Airline, Qatar Airline and others provide airship services from Lahore to Atlanta. What’s Duration Between (LHR) to (ATL) Flights? It takes almost 18 hours and 45 minutes to reach Atlanta however late airlines can take for more time. You should book fastest possible airline which takes minimum time duration to reach Atlanta. Cheap flights have become extremely popular in Pakistan due to growing of Information technology devices and other automatic systems. Everyone wants to save the money which is used on buying the ticket. What’s Benefit of Advance Booking? Most of the people like to do advance booking according to their needs like going on office tour or attending any international conference. You can use the following time duration for advance booking. What’s The Distance Between Lahore to Atlanta? The distance between two different states is 12, 412 km. It is such a larger distance which can be only covered by airplane. Direct Flights VS Connected Flights! Today mostly people want to book connected flights for travelling. The major reason is, in one ticket you can see different countries but the time of stay at airports is not longer because next flight almost ready to fly. Those passengers who want to travel from of Lahore to Atlanta they just book connected flight because direct flights are not accessible.